« Are your shifts adequately staffed? 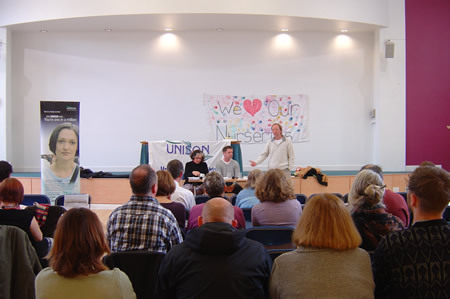 All UNISON members in Pennine Care NHS Foundation Trust are warmly invited to attend one of our aggregate Annual General Meetings. We are holding them in Oldham, Tameside, Bury, Birch Hill & Stockport. Details are below – please download and print a poster for your workplace to help spread the word! This is your opportunity to ask any questions you may have of your branch representatives, ratify our Branch Officers and Workplace Stewards for 2012-13, and help shape the future work of our branch on behalf of our members. This entry was posted in News and tagged pennine care, public sector union, unison agm. Bookmark the permalink. Comments are closed, but you can leave a trackback: Trackback URL.